To this day, John Marsden’s Tomorrow series remains my favourite book(s) of all time. I first read them in primary school and I’ve re-read them many times since. The series doesn’t follow the most realistic of storylines, but it’s not the action that makes these books great. It’s about the characters and the ways in which they grow and develop once thrust into a war zone where they must fend for themselves. Ellie, Lee & Robyn recover from one of many close calls with enemy troops. Millions of fans around the world can breathe a sigh of relief, because this long-awaited film adaptation is almost pitch-perfect. Stuart Beattie has regained any ground lost after writing some pretty bad Hollywood screenplays (Ed -and some good ones, what about Collateral and his uncredited work on 3:10 to Yuma? ), and the somewhat disappointing Australia. This is a tightly scripted, expertly shot Australian film, the likes of which has not been seen for many years. While a $20million budget is large for our film industry, it’s still not much for what needed to be achieved with such a large scale book. 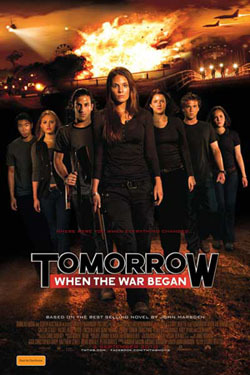 For those living under one of recent history’s deepest, darkest rocks, Tomorrow, When the War Began follows the story of Ellie Linton and her six friends who decide to escape the annual Wirrawee show for the weekend and go camping in the un-traversed bushland nicknamed Hell. On their return, they find their homes abandoned and the electricity and phone lines cut. As they dig a little deeper, they realise that Australia is being invaded by an unknown military force, and their little country town is being used as a transit-way for the enemy as they stream in from the nearby Cobbler’s Bay. Beattie uses the distinctive Australian landscape to his advantage. When the movie’s production was first announced, I had two main worries. The first was that Beattie was the writer/director and didn’t have the most promising track record. Secondly, I feared that the assembled cast would not do these characters justice. It was such a relief to see these eight actors bring much-loved characters to life so well under the impressive direction of Beattie. In the space of only two hours, I fell in love with nearly every one of them. Highlights include Caitlin Stasey as the morally and emotionally confused Ellie and Deniz Akdeniz as the lovable and mischievous Homer. Though Beattie has written Robyn (Ashleigh Cummings) as a more religious caricature, she becomes more layered as the film progresses. One of Beattie’s greatest artistic changes to the source material is with the character of Chris (Andy Ryan). He steals the show mid-way through the film with a much-needed comedic monologue not seen in the book. 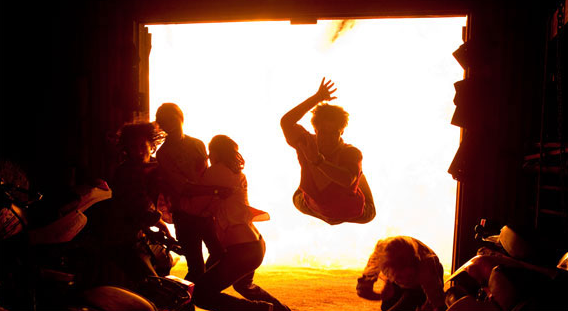 What will impress audiences the most is the wonderful stunt work and action sequences rarely seen in Australian film. This film is a genuine thriller that barely gives the audience time to breathe. Tomorrow is definitely on par with American action films in terms of its special effects. The most remarkable of these set-pieces has Ellie at the wheel of a construction truck, with two very impressive looking enemy vehicles in hot pursuit. The stunts in this film are unparalleled in recent Australian film. Though Australian films shouldn’t be striving to become a clone of their Hollywood counterparts, this is certainly a film that could reinvigorate our struggling film industry and make the money it deserves. Thankfully, Beattie hasn’t sacrificed the heart of the story to achieve this. He stays true to John Marsden, the characters and the fans, while also adding his own little twists. Audiences will be left wanting more and there is indeed so much more to tell. Luckily for us we have an experienced and passionate group of people willing to bring this story to the big screen. If the films make enough money at the box-office, the plan is for a trilogy, followed by a TV series. All we need to do is show our support and pride for one of the best films to come out of this country in the last decade.